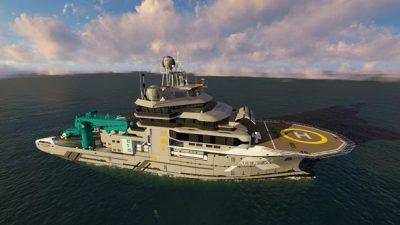 This state-of-the-art explorer vessel is set to discover all of the sAlucia2 & FarSounderecrets of the ocean. FarSounder’s 3D FLS, with no moving parts, is an exemplary addition to Alucia2’s navigation capabilities. With the inclusion of a FarSounder-1000, operators of the vessel will be able to view a true underwater 3D image ahead of the ship up to 1000 meters range. The sonar’s highly-innovative technology will assist in the prevention of collisions and groundings as the OceanX team explores parts unknown. FarSounder, Inc. is a U.S. based high technology marine electronics manufacturer specializing in underwater acoustics. With unique patented technology, the company has a global customer base of commercial, government, and private sector users. The company is the recognized leader in real time 3D sonar systems and has been selling its flagship navigation and obstacle avoidance systems since 2004. FarSounder’s product lines include its Ship Protection System, which followed years of both IR&D and U.S. government funded research. The 2015 Tibbetts Award winning FarSounder Ship Protection System is for those owner/operators who demand the best solutions for assuring the safety of their passengers and crew. The system provides detection, classification, and alarms of underwater threats. Portside, platform, and shore based systems are also available for waterfront security.